I bought my surf baby bedding used for an really cheap price. When I found the Pottery Barn Kids Island Surf nursery bedding set for sale I had my doubts about it, but it was so cute and the price was very affordable. I looked at past auctions and saw that people seemed to buy used PB Kids bedding all the time and their was lots of positive feedback. I thought that maybe the quality is so good that it holds up through repeated washings better than cheaper sets. And how much damage could a newborn inflict on a crib set anyway? I know, a baby can stain even if they aren't strong enough to tear, but there are no stains that I can find on the crib quilt or the sheets and I checked it out pretty thoroughly before I left my rating. This collection had everything that I wanted for my baby girl's surf nursery theme. I'm in love with the Hawaiian print fabric, the embroidered palm trees and although it was unexpected I believe that I'll try the pink and white gingham fitted crib sheet that (supposedly?) matches the crib set. The only part of my surfboard theme baby nursery decor that is lacking would be the curtains! I'm looking for palm tree print fabric that match the white and pink crib skirt that is embroidered with hot pink palm trees. Someone mentioned that Lilly Pulitzer fabric might work, but I haven't found what I'm looking for yet. 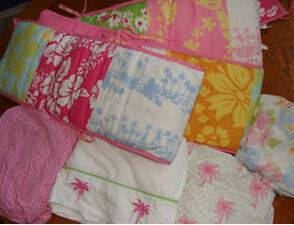 If you know of a white fabric that has a pink palm tree print that will work with the surf baby bedding that you see in the picture, will you please post your resource and the name of the fabric here on Unique Baby Gear Ideas, please? I bought a used crib set, too and am very happy with it. I got the curtains, the quilt, the baby mobile, crib skirt and even some cushions for the rocking chair. The fabric showed very little wear at all and needed only to be washed and pressed. The only thing that I need to buy now are a couple of fitted crib sheets and the nursery is good to go! I found some really cute fabric with a surfboard pattern at a yard sale which, I know, doesn't help but I'll look to see if I can find the name of the fabric on it anywhere and post.